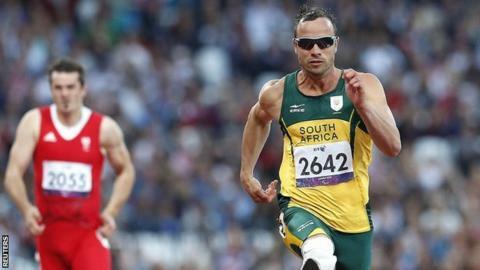 Oscar Pistorius secured his first gold medal of the 2012 Paralympics by anchoring a South African T42-46 4x100m relay victory. The South African team won in a new world record time of 41.87 seconds. Brazil and defending champions USA pressed hard, but both nations were disqualified which meant China and Germany took silver and bronze. Earlier Pistorius, the defending 100m champion, qualified with the second quickest time for Thursday's T44 final. It was the 25-year-old's first appearance on the track since a surprise T44 200m defeat on Sunday, where he had to settle for silver behind Alan Oliveira. Pistorius raised concerns over the length of his opponent's blades, claiming they were "not running in a fair race". But the South African later apologised for the timing of his outburst and looked focused for the 100m despite the controversy he raised, crossing the line in 11.30 seconds. However, Great Britain's world record holder Jonnie Peacock underlined his status as event favourite with the fastest time of 11.08 secs. World champion Jerome Singleton finished behind Peacock, but his time of 11.46 secs was the slowest of the automatic qualifiers.